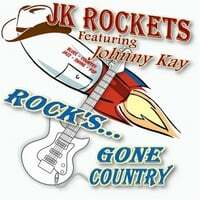 Rock's Gone Country is a tribute to Rock 'n' Roll and it's Country roots. Rock 'n' Roll came from blending country music with blues and some jazz. This, I feel, is the essence of country music. To all of the loyal Rock ‘n’ Roll fans...through all of these many years... This music is dedicated to you and to Bill Haley, the "Father of Rock ‘n’ Roll". I am thankful that I had the honor of playing and recording the music that started it all! And I will be forever grateful for the many years (1960-72) that Bill Haley had me play lead guitar as a "Comet" and be his friend. Many of the songs may be new and original; but, the sprit of the rock music - that started it all - will always be evident within each song. Rock's Gone Country is a tribute to Rock 'n' Roll and it's Country roots. Rock 'n' Roll came from blending country music with blues and some jazz. Bill Haley was a pioneer in mixing these musical modes way back in the very early 50s, and this mixture is still with us today. This album is my personal expression of the rock and country music that I love! Every song in this album tells a story. This, I feel, is the essence of country music. The lyrics may be fun, sad or just plain silly, but it's the lyrics that help make country songs memorable. I hope you enjoy listening to these tunes as much as I did writing and recording them. Yes, today's country music now has a big helping of Rock 'n' Roll blended into it... and yes... Rock's Gone Country, but I know that it really never left!